We are looking for kitty friendly folks who might be willing to share their time and home with kitties in need. We have three types of fostering opportunities depending on your preferences. Every foster family helps us to make a tremendous difference in the number of cats we save each year. There is no cost to you but a commitment of time and attention. Fostering is flexible enough for most lifestyles. We will match the kitties to each foster home's needs and wants. 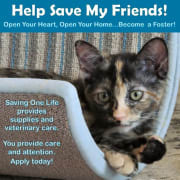 By offering your time, energy and home to a cat in need, you prepare the animal for adoption into a permanent home as well as help prevent overcrowding in our shelter which is at records levels in Maricopa County. Respite Fostering: Welcome a fully vetted kitty for a week or two. Most likely, these kitties are either needing a break from the adoption center or need a place to hang out until there is room at one of the adoption centers. Long-Term Fostering: Welcome a kitty who is ready for adoption but cannot go into the adoption center. It may be due to daily meds or kitty doesn't do well at the adoption center. Kitty is fully vetted and needs a loving family to spend time with. This option is also available for kitties who are not eligible for adoption (i.e. hospice care, serious medical condition, etc.). Traditional Fostering: Welcome kitties from a shelter or the like who are in need of vetting (vaccines, deworming, microchipping, etc.) before adoption. Kitties remain in foster from 2 - 8 weeks depending on previous vetting received. Kitties of all ages are available. Have a dedicated space to place foster cat(s) away from your household pets for at least 14 days (required quarantine). If you have a cat, this might seem incredibly familiar. The only difference is that we provide the food, litter and cover the medical expenses. Primary caregiver must be at least 18 years of age. Have a spare room or space to dedicate to the cat or kittens while at your home (if unvetted). Willing to heap love and attention on this kitties. Own your home or have a rental that permits animals of this nature. Reliable transportation, insurance and valid driver's license. Property Insurance (homeowners or rental). We coordinate to ensure that animals are cared for and / or relocated when a foster is out of town or needs a temporary break from fostering (having company in, surgery, etc.). This is a great opportunity for empty nesters, retired couples or someone who isn't sure they are ready to adopt but would like to help in the meantime. Please consider getting involved. We cannot help cats when we don't have foster families available. It is that simple. Depends on type of fostering. Can be anywhere from 1 month to 6 months. Spare bedroom or bathroom if / when quarantine required.